This is our custom-built 6 channels of TRS 1/4" to Two XLRs (one Male, one Female) insert cable. Construction is Neutrik TRS & XLR connectors with Mogami 2933 snake cable. Neutrik connectors are some of the best connectors around. Mogami wire is the best wire, used in the best studios for it's ultimate sound qualities and durability. Mogami 2933 cable is very flexible, durable, heavy-weight cable. 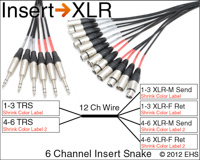 Each channel is constructed as a "Y" for Insert Send-Return, wired TRS out to two XLR connectors, the first (XLR Male) labeled for Send and wired to the Tip, the second (XLR Female) labeled for Return and wired to the Ring. Photo 2 shows expanded view of the two ends with gray and red shrink color labels and yellow master and a close up of the labels. Mogami 2933 6 Channel Insert Snake with TRS 1/4"